Home Health Drug reverses one baldness type; is male pattern next? In his mid 40s, Mike Thomas went bald. Not a “little bald spot in the back” kind of bald or “receding hairline” kind of bald, but almost totally and completely bald. He was diagnosed with alopecia areata, an autoimmune disease, and he was devastated. He looked, by his own description, like a “freak,” with his eyebrows and eyelashes completely gone. He could feel it when people looked at him. Some of them quietly asked whether he had cancer. “I’m in the real estate business, and I’m active in my community, but I started to shy away from people,” said Thomas, who asked that his real name not be used in order to protect his privacy. “It’s incredible. I’m so happy to have it back,” he said. As part of a study conducted at Stanford and Yale, Thomas and 65 other alopecia areata patients took the pill, called Xeljanz, which is prescribed for people with rheumatoid arthritis, another autoimmune disease. More than half of the study subjects saw hair regrowth. A third recovered more than 50% of their lost hair. In a separate study, nine of 12 patients with alopecia areata recovered more than 50% of hair regrowth using a similar drug, Jakafi, which is approved for cancer treatment. 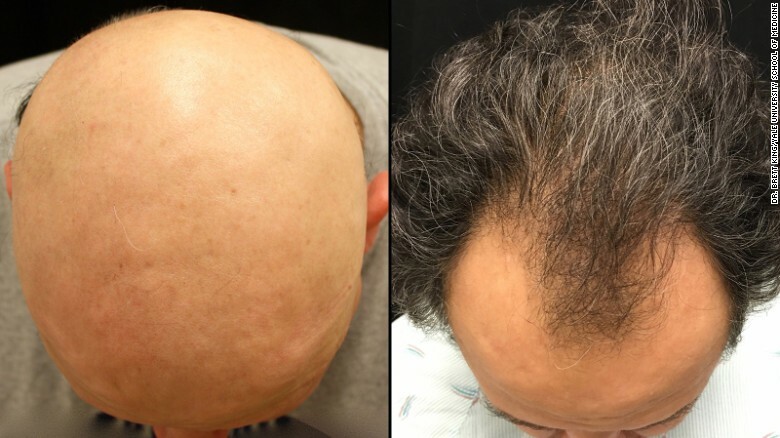 Although researchers say this is potentially great news for people with alopecia areata like Thomas, what does it mean for men who have hair loss because — well, because they’re men and they’re older? Thomas’ head may help answer that question. When his hair grew back, he still had a receding hairline. That’s because the Xeljanz pill gave him back his 47-year-old head of hair, not his 25-year-old head of hair. So now Thomas’ dermatologist, Dr. Brett King at Yale, is trying something else: rubbing an ointment containing Xeljanz on the heads of men with alopecia areata. Will the men grow back full heads of hair, or will they be like Thomas and many of the other men in the study and grow back a head of hair with male pattern baldness? Dermatologists are deeply divided between skepticism and optimism. King strongly suspects that the ointment won’t get rid of male pattern baldness. But others are more optimistic. Dr. Angela Christiano, a co-author of the recently published study, had success with Xeljanz when she made it into an ointment and rubbed it on the skin of mice with skin engineered to be like the skin of bald men. 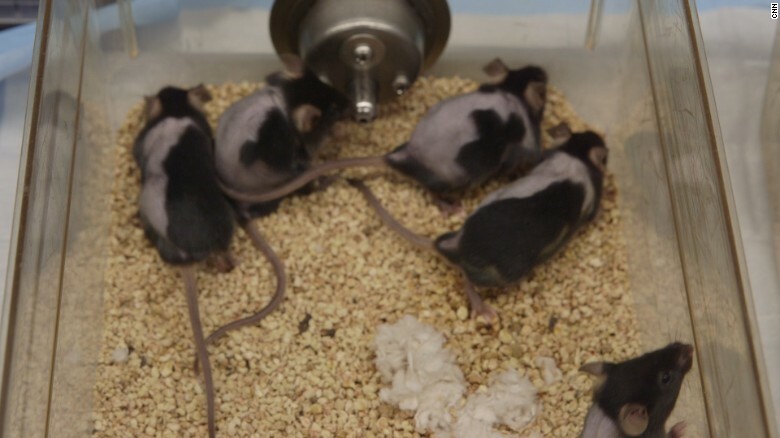 Bald mice regrew hair on their right sides but not on their left after being treated with an experimental cream for hair loss. The ointment was rubbed on the right side of the mice and not on the left, and the results are plain to see. Though she thinks men might have the same success with an ointment, she said the trick is that it has to penetrate properly. Compared with the paper-thin skin of mice, human skin is “much thicker, and it’s oily, and it’s deep, and it’s got a fat layer — so there’s a lot to think about when making a good topical formula,” said Christiano, assistant professor of molecular dermatology at Columbia University Medical Center. Modern medicine can treat big cancerous tumors and complicated neurological diseases; it should be easy to get hair to grow, right? “You might think you could just sprinkle something on your head like what you use to get grass to grow,” said Dr. George Cotsarelis, a dermatologist at the University of Pennsylvania. But sadly, the physiology of hair growth is much more complicated than that. King, an assistant professor of dermatology at Yale, said that with an autoimmune disease such as alopecia areata, you’re essentially trying to trick the environment surrounding the hair. But with male pattern baldness, you’re dealing with a hair follicle that’s pooped out. “It’s like taking a brown plant that’s all but dead and bringing it back to life again,” he said. And much less money is spent on solving this problem than you might imagine. “People think major pharmaceutical companies must be spending billions of dollars on this because the payoff could be so huge, but that’s not the case,” King said. He said big companies are concerned that the Food and Drug Administration would approve a treatment for male pattern baldness only if it had no or few side effects, since it’s treating a cosmetic problem and not a disease. Some men, however, say they suffer psychologically from losing their hair, especially if it’s at a young age. Cotsarelis, a professor at the Perelman School of Medicine, is working with relatively small companies on stem cell therapies for male pattern baldness and on tissue engineering, which involves growing hair-producing skin on a tiny scaffolding and then transplanting it back onto the scalp. “In the end, I think there are going to be multiple ways to treat male pattern baldness, and some will work fabulously well in some people and not so well in others,” Cotsarelis said.